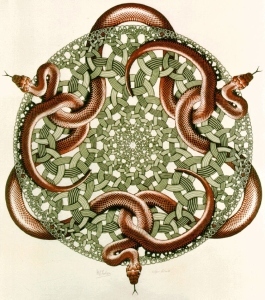 The Phibbon (see blog entry The Phi Ratio Moment, or The Phibbon) is a metaphor for the dynamic spiraling of the serpent dragon, able to curl its way into any dimension. 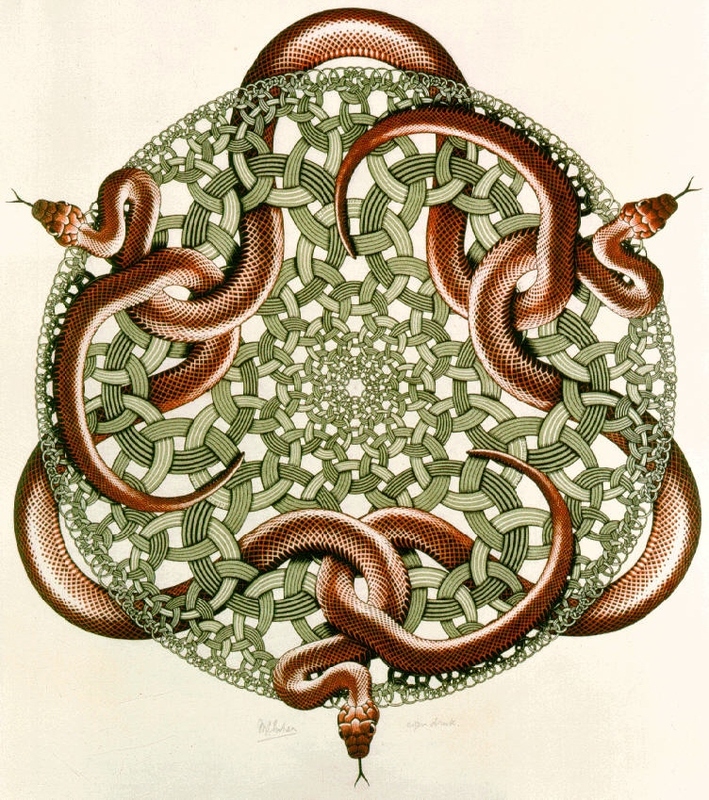 It is the snake circling around the axis of the caduceus. It is the mushroom whorl that connects infinite dimensions through the mycelial web, communicating through a neural net of Phibbons. Phibbons move along waves of exploration and engagement through edges, faces and angles of geometric structure. An edge, face, or vertex of an angle will change the direction of movement along the Phibbon by adding their influence of guiding pattern. These structural containments create multiple curves along the Phibbon, and are what makes the Phibbon fractal. The determined flow is retraceable through recovering the definition of the arcs. This may actually be the geometry of memory. The relationship of 5 to 6 expresses the harmonic relationship of the wavy Phi ratio Phibbon using the dual and balanced structure of 6, expressed as the hexagram, a.k.a. the Star of David. The opposing equilateral triangles help the Phibbon explore within limits and balance, knowing where to center to find itself in a reality. The 6 does not need to be a prison of balance. It too can be fractalized into all dimensions, as is expressed in the Flower of Life. But it is the natural dynamic movement of the Phive Phibbon that allows biological and life exploration through these realms. 6 is crystalline and structural; 5 is dynamic and biological. 4 is reduction into orienting in a single plane or reality. 3 is a detail or focus related to the plane. 2 is aspect in duality. 1 and 0 are the Torus of All and Uniquity, in fractal union. This entry was posted in ESG Circle Blog, Geometric Philosophy, Sacred Geometries, Sacred Number and tagged Embodied Geometry, number, sacred geometry. Bookmark the permalink.